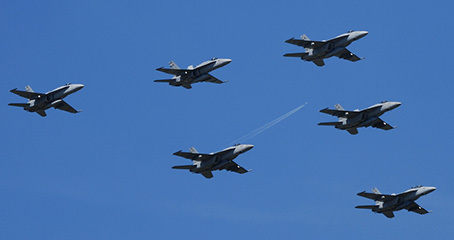 On September 14-16, 2012, another edition of the NAS Oceana Air Show was organized by the U.S. Navy. Dave O'Brien contributed his photo report of the show. Naval Air Station Oceana in Virginia Beach VA once again welcomed the air show community through their gates. After Mother Nature was less than cooperative for the show last year with three days of rain, pretty much cancelling 90% of the 2011 acts, she more than made up for it with three days of great weather this year with temperatures in the mid 80s °F. As the US Navy's Master Jet Base on the East Coast, the air show includes a great act that Oceana calls the Fleet Demo. This consists of both Legacy and Super Hornets taking off and acting out a mock attack on a target: Coming in from different directions, showing the different attack patterns the Navy uses and a little pyrotechnics for some special effects. The US Navy of today operates both the F/A-18C/D Hornet, nowadays dubbed the Legacy Hornet, and the newer F/A-18E/F Super Hornet. The Strike Fighter Squadron 106 (VFA-106) "Gladiators" based at NAS Oceana provides the East Coast's Tac Demo with both Legacy Hornet and Super Hornet. The F/A-18C Legacy Hornet Demo opened the show on Friday, and headed up the US Navy portion of the show on Saturday and Sunday. The F/A-18F Super Hornet Demo flew an incredible demo in the afternoon, providing lots of vapor shots for all the photographers. The F/A-18C Legacy Hornet and F/A-18F Super Hornet each teamed up with the SB2C Helldiver for the U.S. Navy Tailhook Legacy Flight, showing the Navy's carrier-based airpower of yesterday and today. This SB2C-5 is owned by the Commemorative Air Force and is the only Helldiver flying today. Not to be outdone by the Navy, the U.S. Air Force took center stage with a QF-4 Phantom II demonstration. The QF-4 is a drone conversion of the Phantom which can also be flown remotely to eventually become a target of a live missile, ending its impressive career. The F-16C East Coast Demo from Shaw AFB met up with the Phantom to perform the U.S. Air Force Heritage Flight. Sadly, once all the QF-4s are gone, surplus F-16s will be the next aircraft to be converted to Full Scale Aerial Target (FSAT) drones. The better performance of the F-16 compared to the F-4, means the QF-16 will be more representative of fourth-generation targets. One interesting performer among the civilian acts was the Yak-9. Serving the Soviet Union, this Yakovlev fighter first saw combat in late 1942 during the Battle of Stalingrad. In production from 1942 to 1948, the Yak-9 is the most produced Soviet fighter. But this example was only built in 1997, using mid 1940's parts that had been found in a Russian warehouse they explained. The Yak-9 teamed up for some passes with the Black L-39 subsonic trainer to show how the propeller-driven fighters had to outmaneuver the faster jet-engined fighters that they encountered later in the war. To have a spectacular parachute display, the Oceana air show had the British Army's Parachute Regiment display team. The Red Devils performed their Mass Jump from a US Navy C-2 Greyhound of VRC-40 "Rawhides". The C-2 is an excellent jump platform and was used in the past to airdrop special operations units such as the SEALS until the airframes approached their landing limits and had to be preserved for the vital role of Carrier Onboard Delivery. Since the C-2s have undergone a Service Life Extension Program (SLEP), the "Rawhides" can now fly airdrop missions again. The civilian jet display team for the 2012 Oceana air show was the Black Diamond Jet Team This team flies four L-39 and two MiG-17 jets. The MiG-17s are flown by well renowned Dale 'Snort' Snodgrass and Mike 'Buick' Eberhardt, both USN retired veterans. These two guys are flying the pair as close as the Blue Angels or Thunderbirds do, they were amazing! Of course the best fitting jet display team for an air show at one of the Navy's Master Jet Bases is the US Navy's own demonstration team: the Blue Angels. After the USMC C-130 "Fat Albert" solo performance, the USN Blue Angels jets took over the sky. The four-plane diamond formation and two solo jets flew their aerobatic maneuvers perfectly as always, joining up for the six-jet delta formation to end the show. The Oceana air show includes a great night show which they open up to the public Friday evening, after the Friday practice sessions are over. The Twilight Air Show started at 5pm with the F/A-18C Legacy Hornet which was teamed up with the SB2C Helldiver after the Hornet Demo had thrilled the crowds. This is the only operational Helldiver flying today. They performed their Tailhook Legacy Flight showing the Navy's airpower of yesterday and today. After the Blue Angels' C-130 "Fat Albert", the Black Diamond Jet Team took to the skies next with a beautiful setting sun as its back drop. The evening show was closed with the F/A-18 Super Hornet afterburner fly-over and ended with fireworks. It was so nice to be able to see the full show this year after our 12 hour drive one way. I would like to thank the Public Affairs of NAS Oceana for their support and Mother Nature for making Oceana's 2012 edition a great show.